I prayed that today would be filled with reminders of Our Heavenly Mother and that she, who knows sorrow and grief comparable to none, would provide comfort to my despondent heart.... Mary listens. The temperature was so unseasonably cool, that we spent most of the afternoon in the back yard, enjoying the beauty of God's creation. 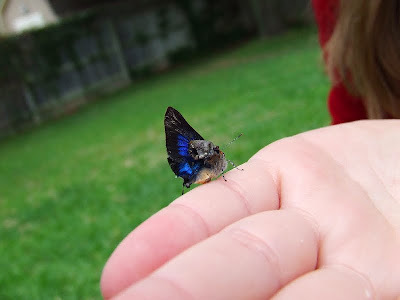 Sunshine rescued this bright blue butterfly(?) with a damaged wing and named it "Maria". My family so generously bestowed upon me a Star of the Sea rosary made by the hands of a friend I've never met. She didn't even know who it was going to bless. 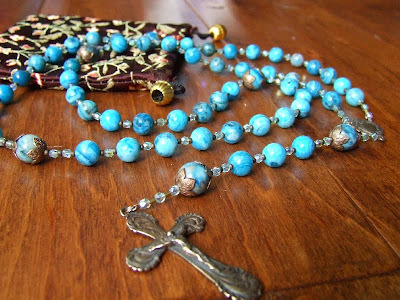 At times, holding tight to these beautiful blue beads during Mass kept the tears at bay. The profound homily given by our favorite Cistercian priest kept all of our attention riveted. After Mass, the same Cistercian father bestowed a moving blessing upon these beads of love that I will think of every time they pass through my fingers. 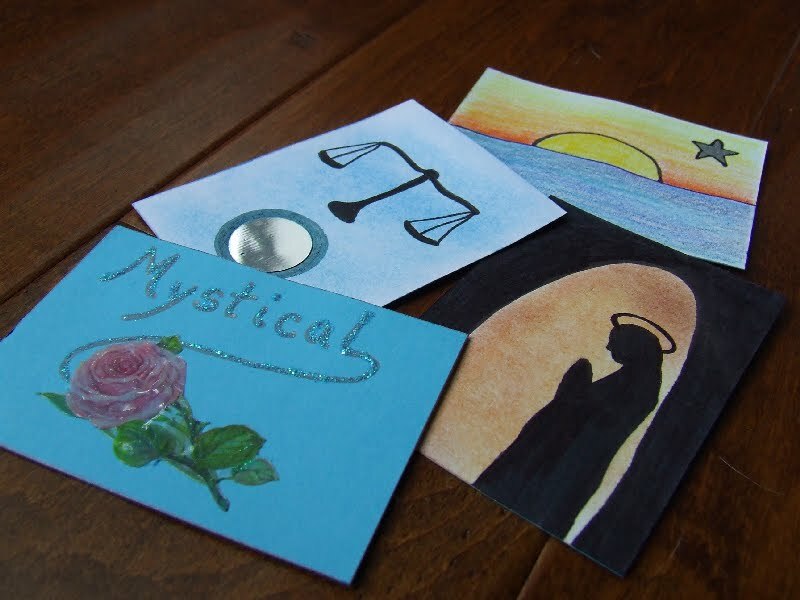 My children contemplated the designs, I helped them visualize their designs, then they completed their own versions for trading later this month and I was "gifted" with these prototypes, not to mention, the time to indulge my creativity which is always a gift. 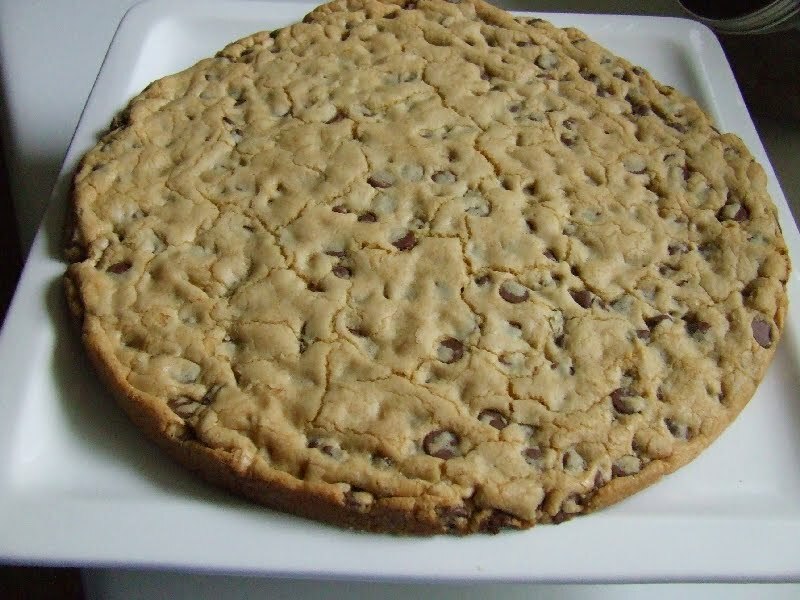 A giant cookie made by Husband and to be decorated later by my sweet children (that's material for another post). Husband makes the best cookies! I like to think Mary did too. Happy Mother's Day, dear friend. You're in my prayers. I've been meaning to tell you that I lit a candle and prayed for you (on Friday actually) at the Basilica of the National Shrine of Our Lady Help of Christians. Love and hugs! Remembered you at Mass this morning, dear Charlotte. What lovely snippets of Our Lady in blue sprinkled throughout your day! Your cards look beautiful (and I shouldn't covet my neighbor's cookie on Mother's Day but boy that looks good!). Have had you on my heart, mind and in my prayer all day today. Remembered you at Mass today. I loved the cool weather today. Been praying for you today! So glad to hear that words of peace and love have given you comfort today. I'm praying for you, dear Charlotte. Happy Mother's Day! What a beautiful Rosary! Use it often and let Our Lady comfort you. I've been thinking of you and praying for you often, especially today! Happy Mother's Day Charlotte! I remembered you at Mass today and shed a few tears on your behalf. May God bless you and keep you and may he pour upon you the healing balm of his boundless mercy and love. late in replying. we were out of town but thinking of you and wishing your sad heart some JOY. I have been praying for you often and with much love. Your Rosary is beautiful...hang onto those beads and give your sorrow to Our Lady and her Son. Big hugs.